Perfect location. Lots of things to do within walking distance. The loud music in the lobby and directly outside the hotel is not a plus, but otherwise our stay was pretty satisfactory. Will never stay here again, walls are paper thin so you can hear everything and smell everything. Our room was filthy, hair and mold on the bathroom walls. Also, parking is not on site and you have to pay for valet, which is not advertised correctly on their website. The Hotel Felix is consistenly my favorite place to stay in Chicago in terms of quality, value and price. My only issue with this recent stay was that my room overlooked the neighboring Godfrey hotel and restaurant/bar, which had loud music blaring into our room until almost 11 a.m. We had an early seminar to teach the following morning, and it made for a rough night. Otherwise it was great, as usual. Nice hotel with clean rooms and confortable beds. Staff flexible with our needs. Excellent! Centrally located hotel with easy access to restaurents and shopping. Rooms are cozy but clean. The Hotel and room were clean. The rooms are pretty tight. The price was low for the location which made up tightness of the rooms and hallways. The hallway had old musky smell that was less then desirable. The room had a slightly more pungent odor. The Staff was very friendly, polite, and helpful. My biggest complaint was the smell in the hallways and my room. This is my third stay here, service is always wonderful. Very friendly staff who are always willing to help out. Still haven't tried Troquet, the restaurant atttached to the lobby, but everything I see people eating looks delish. Very clean and good price for being downtown. Breakfast downstairs was fantastic!! Enjoyed Hotel Felix very much! The restaurant, Troquet, is fantastic with excellent dinner deals and outside seating. The hotel lobby is small and cramped, with the elevators arriving at an awkward juxtaposition w/ the hotel check-ins staff. The check-in young lady didn't tell me small coffee was free so I bought it FYI. It's next door at Big Shoulders coffee, no room coffee or breakfast :( However, the check-in young man "Q" was terrific; I waited for a 12th floor room to be cleaned and he delivered! Husband & I don't get to travel much as we own a small business. Did a long weekend trip to Chicago. Our stay at The Felix was great. Comfortable room, great, helpful staff. Close to many on the places we visited, easy access to transit. The hotel was very nice, clean and well suited for business travel. The only issue I had was I was right near the ice machine and found it loud throughout the evening as other got ice. Nice hotel offering good value for the money. Room very comfortable, only issue was sink slow to drain. Good location and easy to walk to restaurants and shops. There is construction near the hotel but it did not disturb me. I haven’t stayed in many boutique hotels but this is a wonderful place to stay! Awesome quaint and cool hotel in a great area of Chicago. Highly recommended. Located in River North, Hotel Felix Chicago is within a 10-minute walk of popular sights such as Holy Name Cathedral and Driehaus Museum. This 4-star hotel has 225 guestrooms and offers conveniences like 2 restaurants, a 24-hour health club, and free in-room WiFi. Enjoy dining at one of 2 onsite restaurants including Troquet, which specializes in French cuisine. Entertain your taste buds with a beverage at the bar/lounge or coffee shop/café. For your convenience, a cooked-to-order breakfast is available for a fee. Guests can expect to find 47-inch a Smart TV with satellite channels and first-run movies, along with free WiFi and wired Internet. Beds are dressed in Egyptian cotton sheets and down comforters, and the bathroom offers a hair dryer and designer toiletries. Other standard amenities include an iPod dock, a sitting area, and free local calls. 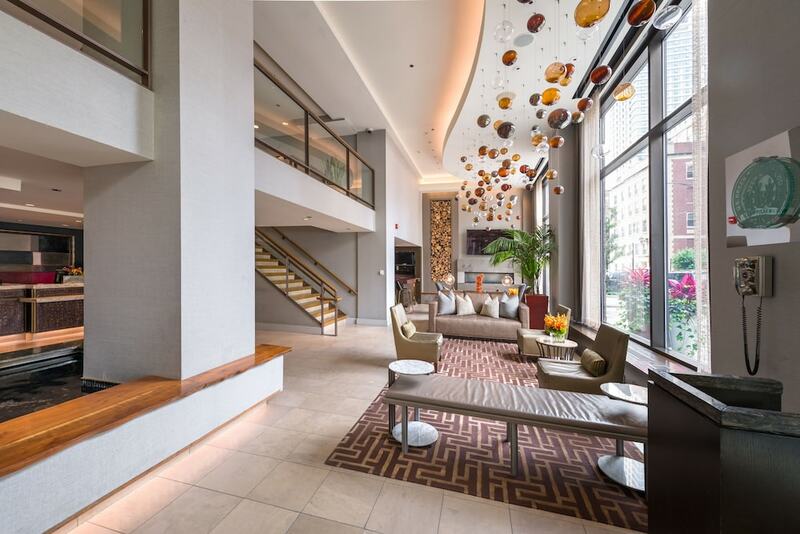 Guests of Hotel Felix Chicago enjoy a 24-hour health club, free WiFi in public areas, and conference space. Parking is available for USD 45 per night (USD 60.00 per night for valet parking), and there's also limo/town car service. Multilingual staff at the 24-hour front desk can assist with concierge services, luggage storage, and dry cleaning/laundry. Other amenities at this boutique hotel include a 24-hour business center, coffee/tea in a common area, and express check-in. Thank you for staying with us. We appreicate your feedback! Thank you for staying with us. We appreicate your feedback and will work hard to fix the things you experienced. Thank you for staying with us! We appreciate your feedback! Thank you for staying at Hotel Felix and providing feedback. It was a pleasure hosting you during your trip to Chicago. We look forward to your next visit. Have a wonderful day. Thank you for staying with us. We hope to see you again! Thank you for staying with us. We appreciate the feedback! Thank you for staying with us! Hope to see you again. Thank you for staying at Hotel Felix and providing feedback. We had great pleasure in hosting you during your visit to Chicago. We hope to see you again soon. Have a wonderful day. Troquet - Restaurant and bar specializing in French cuisine. Taketei - Lobby lounge specializing in sushi. Recreation features at Hotel Felix Chicago include a 24-hour health club. This property will place an authorization for USD 60 for any bookings where payment for the stay will be made on site instead of at the time of booking. For more details, please contact the property using the information on the reservation confirmation received after booking.